An unprecedented public-private crackdown has helped cut taxpayer identity theft reports in half and prevented millions of dollars in fraudulent refunds, the IRS and tax industry officials said Thursday. 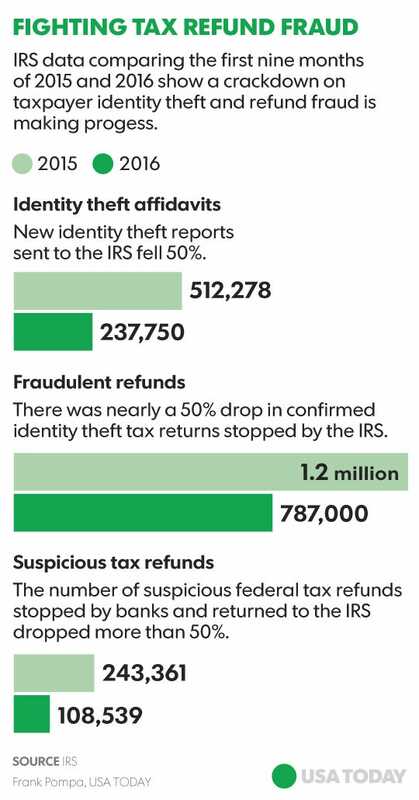 The number of people who filed IRS affidavits stating they had been victimized by identity theft dropped 50% during the first nine months of the year compared with 2015, from 512,278 to 237,750, the federal tax agency said. Similarly, IRS data showed a nearly 50% drop, from 1.2 million to 787,000, in the number of confirmed fraudulent tax returns that made it into the agency’s tax return processing systems. The number of suspicious refunds stopped by banks and returned to the IRS also dropped by 50%, as the number of banking partners in the public-private effort rose, from 514 to 620. “Add all this up, and it means we’re seeing fewer bad returns, fewer bad refunds and fewer taxpayers becoming victims,” IRS Commissioner John Koskinen said in comments prepared for a briefing on the results to date. Formally announced last year, the crackdown was prompted by a years-long surge in tax refund fraud, including an embarrassing breach in which cyber-thieves stole as much as $39 million in federal refunds based on taxpayer information hacked from an IRS website. The effort featured information sharing by the IRS, state tax agencies, private tax-preparation and tax-filing software companies and others. As electronic tax returns were filed, tax-preparation firms gave the IRS information about their review of the transmissions, including any improper or repetitive use of Internet Protocol numbers, the electronic addresses where the returns originated. The tax-prep firms and the IRS also shared information about computer device identification data linked to the tax returns’ origin, as well as metadata from the transmissions. The IRS also placed a new verification code on some of the W-2 tax return forms that individuals used to file federal tax returns. “We have progressed from initial ideas on how to combat tax refund fraud, to developing clear concepts, and now, to executing concrete measures that are materially impacting the fraudsters’ actions,” said Bill Cobb, CEO and president of tax-preparation giant H&R Block. But there’s more work to be done, the officials said. New safeguards planned for the 2017 tax-filing season will focus on “trusted customer” features that help ensure the authenticity of both the taxpayer and the tax return, said Koskinen. The added features will include 37 new data elements transmitted by the tax-preparation industry with each federal tax return filed by an individual. Along with sharing that information with the IRS, the tax industry for the first time will also share 32 data elements from business tax returns. The IRS also plans to place verification codes on millions of additional W-2 tax return forms. Additionally, the IRS and tax-industry officials plan an initial 2017 launch of an Information Sharing and Analysis Center that will provide early warnings about new and emerging identity theft and refund fraud schemes. Original article published on USA Today.